The luxury Port Palace Hotel enjoys an exceptional location in the very heart of Monte Carlo, right at the foot of the Casino. The sleek contemporary design of the accommodations has been realised by Leila Menchari, offering a peaceful atmosphere. 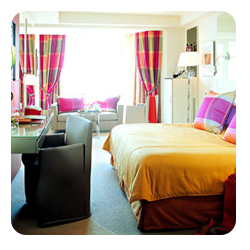 Their quality and luxury equipment will ensure guests a pleasant and restful stay. Colour, sunshine and freshness are the landmarks of the Grand Large restaurant, offering beautiful panoramic views. Guests will also appreciate the terrace, 2 bars, 3 beauty treatment rooms of the Cle de Peau Beauty Institute, a fitness room, a yoga studio as well as a separate sauna and hammam. hotelsmonaco.net is a online accommodation reservation company dedicated to Monte Carlo Principality - we have every kind of lodging including cheap hotel rooms, discount and last minute hotel deals, and luxury 5-star very exclusive hotels. Our goal is to offer the widest choice. We also offer a convenient, fast and secure way to make a booking. We hope that you will find the right accommodation to meet your travel plans. Thank you for your visit on our website - enjoy your stay in Monte Carlo Principality.